Our elegant LED Frosted Glass Reading Light is an economic option for your interior camper trailer, caravan, marine or yacht applications. It is portable for your travel convenience with it's lightweight and shock-resistant characteristics.It does a good job as a bedside lamp. 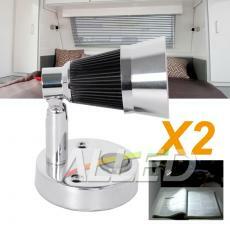 Its soft and bright output enables you to enjoy your reading time without troubling your partner's sleep. High quality materials and fine workmanship ensures stable performance and a long lifespan. Efficient heat dissipation also contributes to its long lifespan.Easy installation is available for your convenience.